One of the best things about spring time is weddings. When I was a little girl, a wedding was for everyone, and it lasted all day long and late into the night. I thought weddings were the most fun for kids. When my Aunt Annie got married, I got a new Uncle Jim. I already knew Jim ’cause he hung out at Grandma’s all the time, hugging and kissing Aunt Annie and making her giggle. She just about never looked at me when he was over. Sometimes she play-kicked him when they sat on the couch and pretended to watch TV, but were really just looking at each other and finding some excuse to touch. Then Jim, who was going to be Uncle Jim, grabbed Aunt Annie’s big toe and tickled her foot. That made her squeal and kick and cry out, “Ji-iiim, Ji-iim,” just the same way Mom said, “De-ean,” when she was pretending to be mad, but was really proud and happy. That’s when I knew Aunt Annie loved Jim more than anything. Everybody got dressed in the best Sunday clothes for Aunt Annie’s and Uncle Jim’s wedding. Aunt Annie looked just like a princess, with a tiara and everything, she even had shoes that looked like glass slippers, but were really plastic because glass could break and cut her foot. She was gorgeous. Uncle Jim looked spiffy in his tuxedo, smelling all Old-Spice aftershave and lemony from the Brylcreem taming every one of his wavy hairs smooth and sleek. My new Uncle Jim did look sooo debonair, I just wanted to run my fingers through his hair. I loved Uncle Jim. Before the fun started, I had to sit through Mass; darn-it, the altar boy lit three candles on each side of the altar, that meant high-mass: high mass was a long, long mass with tons of singing in Latin. Almost every minute Aunt Annie and Uncle Jim knelt up there on the other side the communion rail on a special little short two-person kneeler, just the two of them. I was sure there backs were killing them, ’cause my back hurt just from all that normal high-mass kneeling; sometimes I let my rump rest back on the pew until Mom reached over and gave me a tap on the back, then I snapped to attention again. After Mass got over, everyone marched out and hugged and kissed Aunt Annie and Uncle Jim. Aunt Annie was so, so happy, and Uncle Jim gave me a great big smack right on the kisser. All Mom’s old aunts and uncles hung around the church afterwards while the photographer took pictures inside. All those aunts and uncles and lots of people I hardly knew, mostly Mom’s relatives, asked me about my black eye: I had a big shiner from getting slugged in the eye with a baseball bat while I was figuring out how to hit a home run. That was the fun thing about that black eye; long after I forgot all about how much it hurt, everybody was still going ooo and ahh, saying ‘let’s see that thing’, and looking all sad for me. At last Aunt Annie and Uncle Jim came out of the church, blinking in the bright sunshine, while everybody threw rice at them. That’s the Catholics’ way of saying: Good luck, now go have lots of babies. Aunt Annie laughed and scooped rice out of the top of her dress, which made everybody clap and hoot. Now at last, it was time for breakfast; midnight was a long time behind me and my stomach was sure growling and begging me to put something down there. We had sausage and eggs and bacon, and juice and pancakes, and all sorts of things until I thought I would bust. We just hung around eating and cleaning up and eating some more and talking until it was time for the real reception, which was more eating and cleaning up, and talking some more, only at the real reception the grown-ups drank wine and beer and something called 7-7 and I got all the pop I wanted, that was enough to make my belly popped out like I was expecting a baby. While all the eating was going on, glass clanging got started. That’s the Catholic way of saying let’s see you two love birds kiss; we just kept clanging our forks against the glasses until Uncle Jim kissed Aunt Annie, then we gave them a little break before it all started up again. Finally, finally the dancing started. Everybody danced up a storm, all my cousins and their parents, even all Mom’s old aunts and uncles. Grandpa showed me how to do the polka like a grown-up. He said I had excellent rhythm, I kept right up with him, I was such a natural. That was about the best thing anyone ever said to me, ’cause I just loved to dance. When music came on, it seemed like my legs started to twitch and they wouldn’t let me rest until I started to dance or sway or move somehow. Aunt Annie and her cousin Joey danced Rock and Roll with me and taught me and Deanna how to do the Twist. Deanna already sorta knew how ’cause she watched American Band Stand on TV, but that’s not the same as having an expert, like Aunt Annie show us how. All of a sudden everyone lined up to dance with the bride and groom. Uncle Jim put one arm around my waist, squeezed my hand and pulled me in tight so I could smell all that lemony Brylcreem and Old Spice swirling all around me with Uncle Jim, just dancing away, like nobody else was there; well, for about 30 seconds, when Bonita tapped me on the back, letting me know it was her turn. Uncle Jim kissed me on top of the head, gave me one more squeeze for the road, and let go. I loved Uncle Jim. Did I say that already? That night I slept with a piece of wedding cake all wrapped up tight under my pillow, so I would see in my dreams the man I would marry. I just saw lots and lots of dancing and laughing and eating. It was almost like I never went to sleep. When I got up the next morning, I was hungrier than ever, but it was Sunday, so the cake would have to wait until after church. Sunday is church day, even if I just went the day before. 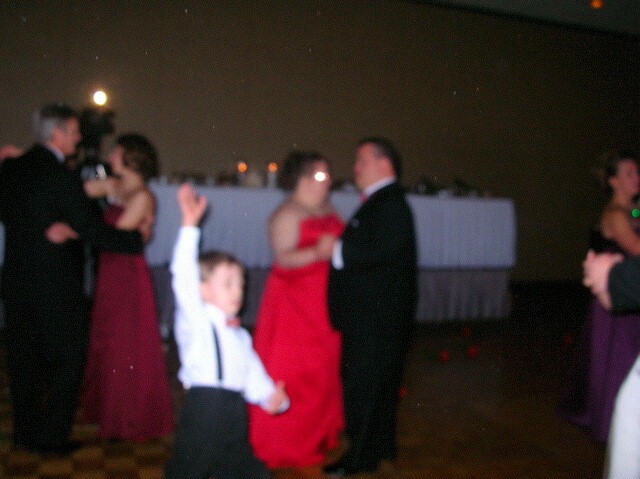 Now I am the old aunt at the wedding, dancing the night away with all my old sisters, my kids, and my grandchildren. I know it’s fallen out of fashion to have kids at weddings, but I’m glad my family still looks forward to seeing the little ones kick up their heels right along side the adults. At the end of the night, G-Money puts his arm around my waist, pulls me in tight and whispers in my ear. I know one thing pure and simple: Love is all around me. Oh Yeah!! I love having kids at weddings too. And of course I love them still!